James leaned slightly against the double door to steady himself. Troy really was a success. He was everything that James wasn’t. Everything that James wished he could be. “What’s wrong with me?” he asked. James Smith is an ordinary man, with an ordinary name, leading a very ordinary life. Little does he know his seemingly insignificant acts of kindness—from saying hello to the doorman every day to leaving a generous tip for a waitress—make a difference. All James can see is others’ successes compared to his failings as a husband, father, and friend. So when his wife decides to throw him a birthday party, James has no idea that one special gift is going to change his perspective—and his life. Counting Candles invites us all to take a step back and gain a unique perspective on the value of our lives. When I read the summary, I knew this was a book I would enjoy reading, but I had no idea how much I would absolutely LOVE it by the end! James Smith considers himself to be an average guy. He's coming up on his 40th birthday and feels like he doesn't have much to show for it. His wife, Molly, decides to throw him a surprise party and she rounds up his friends and others whose lives he has impacted. Throughout the book, we learn who those people are and what his large or small decisions meant in their lives. First of all, I felt that I could relate to James and how he was feeling. Then, as we were introduced to other characters, I could relate to some of their stories, too. A few of the experiences left me teary eyed and I outright bawled at the end. It was interesting to read James's perspective on what was happening and then to later read the point of view of a different character and how they perceived the same event and what it meant to them. The story of their next-door neighbor, Gerald, was especially touching to me. He seemed like a grumpy old man that didn't like them and when I read his story, I was touched by how he really felt and why he behaved the way he did. This book really made me think about how I treat others and ways that I can be more thoughtful as I go about living my own ordinary life. And also to let others know the positive impact they have had on my life. This book is life changing and is high on my list for best books I've read so far this year! A must read! I was excited for the chance to interview Dustin Bradshaw to learn more about him and see what he's up to next! I have always loved to write. In second grade I wrote a book about a dog and that is the first time I really remember writing. I keep a journal everyday and that helps me unwind about the day and I am looking for opportunities to express what happens in life in words for someone else to enjoy. Some of those can be seen on my blog. 2. What inspired you to write Counting Candles? It was always one of my life's goals to write a book. Once my first book, WHITE LILIES IN AUTUMN, was published, I wanted to write more. My wife and I are constantly looking for good--CLEAN--books to read. I wanted to write one too. I wanted to highlight the good people do in the world, even if they don't see how large their impact is. 3. Do you work with an outline, or just write? Most of my books (yes, I have finished more than the two) come from dreams. I sleep with a notebook and pen next to my bed to write them down before I forget the details. However, COUNTING CANDLES was the only book that did not happen that way. So generally I have a rough outline--where I want to start and how I want it to end, but the details and characters develop organically from there. 4. What was your favorite chapter (or part) to write and why? It depends on my mood. 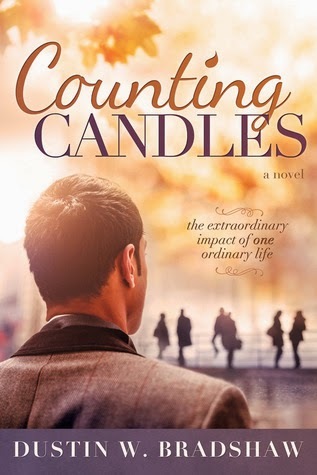 Each chapter represents a different person with different challenges they are facing and I find it interesting to see which characters people are drawn to as they read COUNTING CANDLES. 5. What project are you working on now? Right now I am in the middle of writing a fiction book about three sisters and their lives as they grow up and embark on different adventures in their adulthood. 6. What are some of your favorite books and what book are you reading now? I really like JK Rowling's Harry Potter series. I also like Khaled Hosseini and Michell Moran's work. All three of these authors have a storytelling ability that I would love to develop. Their characters stick with you long after you finish the book. Spend time with Lady Hiva and our son. I like to run, to explore new places and to be around friends and family. 8. Do you have any advice for aspiring authors? Keep writing. It is a form of art and takes practice. Keep reading. To become the best writer you need to find your voice and be true to it. 9. Is there anything that you would like to say to your readers and fans? One of the scariest parts of writing is knowing you are putting a part of yourself out for the world to see and judge. Yet, as large of a risk that is, it is completely rewarding when a reader writes me a note or sends an email to tell me how the book impacted their lives. That is why I write, to learn from others. So thank you all for the support and encouragement. Thanks, Dustin. I'm glad to hear that you're working on another novel and am looking forward to reading it! I'm also looking forward to reading WHITE LILIES IN AUTUMN, which also sounds amazing! Being raised in a small farming community, Dustin Bradshaw thrives on adventure and challenge. He lives by the theme, “If you want to accomplish something, do it!” It was with this attitude that he penned his first book in third grade and, as a senior in high school, entered and won a literary scholarship that he was told no male has ever won. This same adventurous nature has helped Bradshaw achieve many of his life’s goals, including forming that country boy into a accomplished leader. He is now a Foreign Service Officer for the United States Department of State. He and his wife, Lady Hiva, are now posted in Manila, Philippines and will soon be posted to Istanbul, Turkey. I loved this book and thought your review and interview were both fantastic! You have such creative questions.